In many parts of the Northern Hemisphere, January is a cold month, and so a warmup might be just the thing! Here is a simple problem to get you started with this month's Checker Maven challenges--- but beware, they all won't be this easy! 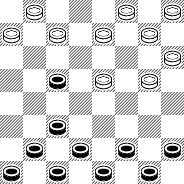 A---A defense from Teschelheit's Master Play of the Checkerboard, unfortunately unsound. 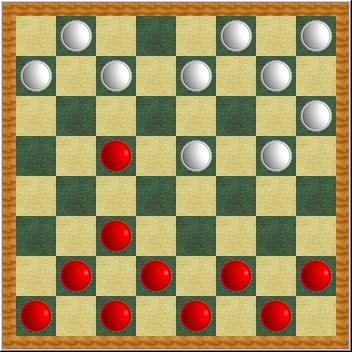 B---Loses at once, although White is probably already lost. One alternative line of play from the KingsRow computer engine is this: 26-23 19x26 30x23 11-15 18x11 8x15 32-27 5-9 31-26 4-8 25-22 8-11 23-18 15-19 27-23 11-16 17-13 7-11 29-25 1-5 22-17 3-8 17-14 8-12 25-22 11-15 18x11 9x27 Black Wins. How quickly can you solve this one? Click on Read More for the solution - but give it a good try first. 19-24 28-19 11-15 18-11 8-31 Black Wins. 19-24 27-20 11-16 20-11 8-31 Black Wins. Article edited and expanded on 9 July 2016.